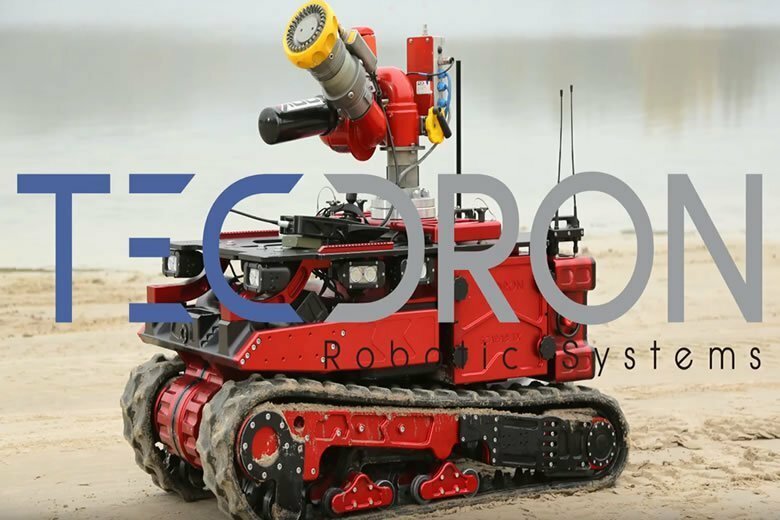 The Scarab TX Firefighting Robot is a remote controlled robot, for intervention and technical assistance. It is often used by firemen as a fire-fighting robot. Thanks to its thermal cameras and other sensors, it can give instant eyes inside a fire to the rescue teams. Like a scout, it is able to access areas which are too dangerous for humans to approach thus improving the security and safety of missions. It can also directly attack a fire with a water cannon. It is versatile and can be equipped with various accessories: water canon, smoke extraction fan, stretcher, handling arms, electric winch, bull bar, trailer hitch, anti-rollover system, sensors, etc. The blocks are articulated in order to easily adapt itself to the land on which they operate. This allows the robot to overcome obstacles quickly and keep good stability. It is very easy to drive and its aerospace alloy design gives it an unparalleled robustness. Tecdron developed new block transmissions equiped with engines 1500W (Tecdron own Development), and electro-magnetic brakes. SCARAB TX has a powerful torque more than 3000 Nm. Thanks to its compact dimensions and low gravity center, SCARAB TX is agile and allows easy operation on stairs.